The US navy gets its new Spy plane, IT is big !! Discussion in 'News & happenings' started by ManISinJpr, Jun 17, 2012. The era of unmanned drones is already upon us, making a new entry into this sphere is the new. MQ-4C Triton, It has a wing span of 130 feet, canfly for long hours and can spy on an area of 2.7 million square miles ( yes ) in real time !!! fitted with the smartest optics and gadgetry still not known to man !! Excerpts borrowed from the US Navy site. PALM DALE, Calif. (NNS) -- The unmanned aircraft community received its first glimpse of the U.S. Navy's MQ-4C Broad Area Maritime Surveillance (BAMS) unmanned aircraft system (UAS) during an unveiling ceremony June 14 at Northrop Grumman's Palmdale, Calif., manufacturing plant. "Last year, we proudly celebrated the centennial of naval aviation--this year we have seen the rollout of a new patrol aircraft and now, the beginning of an unmanned tradition in our fleet with the rollout of BAMS," said Vice Chief of Naval Operations Adm. Mark Ferguson who spoke at the unveiling. "BAMS is uniquely suited to meet the demands of the maritime environment and give us the advantage we will need in the future--history will record this introduction as a milestone in the second hundred years of naval aviation." Now officially called the Triton, the MQ-4C's unveiling caps more than four years of development with Northrop Grumman for the surveillance aircraft. The Triton will be an adjunct to the P-8A Poseidon as part of the Navy's Maritime Patrol and Reconnaissance Force family of systems. "It's a phenomenal event to see the fruits of our labor come to fruition after four years of hard work and dedication to this program," said Capt. James Hoke, program manager for the Persistent Maritime Unmanned Aircraft Systems Program Office (PMA-262), which manages the Triton program. "We are looking forward to continuing testing and evaluation, parts assembly and installation and radar risk-reduction tests." 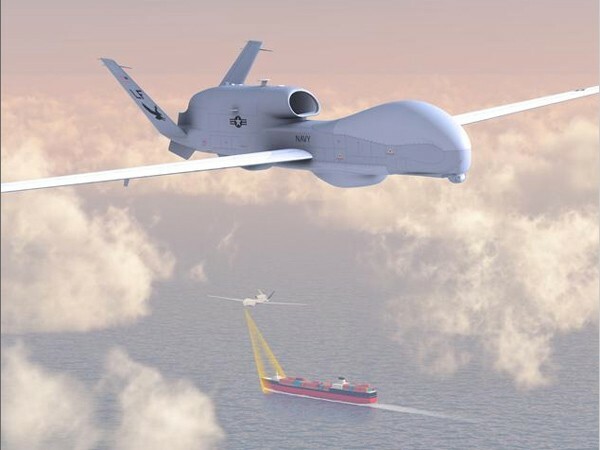 The next steps for the Triton program involve continued testing, functional requirements review and first flight for the system development and demonstration (SDD-1) aircraft. SDD-2 will follow a few months behind SDD-1. The Triton air vehicle, which has a 130.9-foot wingspan, is based on the Air Force's RQ-4B Global Hawk, while its sensors are based on components and systems already fielded in the Department of Defense inventory. The Triton's new features include the AN/ZPY-3 multi-function active-sensor (MFAS) radar system, the primary sensor on the Triton. The MFAS completed first flight in December aboard a Gulfstream aircraft. With the MFAS radar's capabilities, the Triton will be able to cover more than 2.7 million square miles in a single mission. The Triton's capability to perform persistent intelligence, surveillance and reconnaissance with a range of 2,000 nautical miles will allow P-8A, P-3C and EP-3E aircraft to focus on their core missions, adding to the capability of the Navy's Maritime Patrol and Reconnaissance Force. For more information about the Triton, go to www.navair.navy.mil/index.cfm?fuseaction=home.displayPlatform&key=F685F52A-DAB8-43F4-B604-47425A4166F1. Hmm.. Its a slightly larger variant of the Global Hawk .. It is something PAR extraordinary !! I want to take a bet ! anybody want to place ? Nopes.. not in the near future .. We are still way off on Driverless cars at it is .. so having Pilotless commercial flights .. even Cargo/Transport ones seems to be pretty off. Anyhow it will always be cheaper to have a human pilot fly the aircrafts because loosing one plane in a crash is the bigger loss than the pilots salary. The whole point of having UAVs and UCAVs for the military is that they are more expendable .. and easily replaceable, to protect Human lives.. The higher costs involved in doing so are not a factor. The Global Hawk costs twice as much as a F-18 Super Hornet. Military applications are high risk .. so combat-result supersedes cost ..
Civilian/commercial applications are low risk, mainlining low cost of operation will the priority. You can afford to loose few UAVs to get the job done... Result matters. You cant afford to loose even a single commercial aircraft .. its a business. I am contrarian better by habit you have 50% channce of loosing and I 50% chance of winning !! Okay .. I'll take it .. No Pilotless commercial aviation withing the next 5 years atleast ..
LMAO !! you fell in the trap right away !! who said next 5 years, I am giving you the odds, so you can't mention that ! Now you are stuck, I wanted all members to learn this side betting thing !! You are no good as a side better, side bets have 2 options only and no clauses..
Its believed that the US govt has 64 UAV bases in US itself. Not considering the numbers it has abroad. A UAV has much better applications than just keeping the people on the ground, and not in the air. No government has thought twice before putting pilots in test planes. They could have very well used a remotely operated test bed before putting a human being in it for testing purpose. The UAV serves a purpose of longer endurance ( Flight crews can operate it in shifts on ground ). With in flight re-fueling being an option, it can stay afloat virtually endlessly. With Solar UAVs under testing and the new X series space craft also completing a mission, the future is slim, trimmed down, and remote controlled.Rather than the 50s and 60s when flight crews did 18hr + missions and fatigue was a key factor. With a self detonate mechanism upon being shot down/damaged, there is no risk of loss of technology. Whereas if a Pilot ejected over enemy territory there was an issue of retrieval / extraction, and also loss of technology to the enemy if any part of the aircraft survived upon impact. In the event of a potential Dirty Nuclear bomb attack ( as a possible future scenario ), a UAV will provide better re-con/coverage since the radiation damage can be sustained by metal, but not by human tissue. Not requiring the plumbing/installation to support a human being ( Air conditioning/oxygen system, control system, avionics, displays, seating space, Weight considerations ), a UAV can / is made slimmer, lighter, more efficient with a higher payload. And that makes for an incredible VFM proposition. The blurring of lines across the various sections of the army, a UAV can be operated by ground forces even. So rather than co-ordinating with the air force for an air strike during a ground campaign, the ground forces can control and get effective strike capability right in their own hands. So rather than communicating to and fro, they get the job done, right there, themselves. Oh and we are not going pilotless commercial aircrafts anytime soon in the future. Not even for the next 10 years. They might start testing and developing it but not till the computers/avionics are robust enough to handle emergencies/failures. Even so, there will always be a pilot to supervise all the operations. WE are already Pilotless in our flying as it is. From the take off roll, till the landing the pilot can virtually fly the aircraft without touching the control column even once. However a computer cannot be relied upon to take the extreme maneuvers or actions that save an aircraft ( or for that matter, that doom an aircraft ), but only a human being can. Besides even though most aviation accidents have been blamed on pilot error, if there were 2 aircrafts on the tarmac, one with a pilot and the other without one, which one would you prefer. And no Bill gates sitting calmly jokes, since the software is MS.
Its human nature. No matter how robust technology will get, we as passengers will not board a pilotless aircraft. And companies wont make that mistake since they can grill a Pilot to make the take off / landing more efficient, conserve fuel, cut operating parameters to save fuel etc etc, but not a computer.